BEIJING—Thousands of people in China are trying to write their own ticket out of the country by learning French. 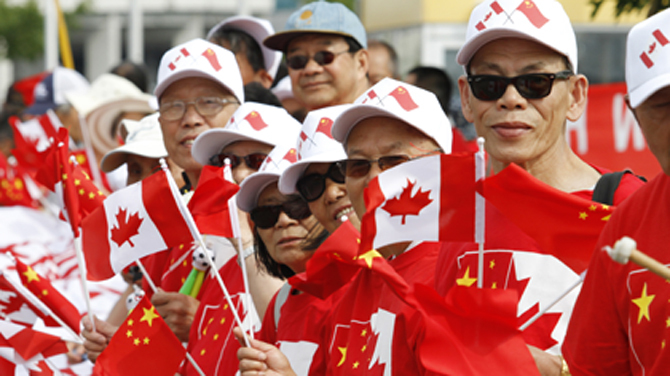 Chinese desperate to emigrate have discovered a backdoor into Canada that involves applying for entry into the country's francophone province of Quebec—as long as they have a good working knowledge of the local lingo. Yin Shanshan said the French class she takes in the port city of Tianjin near Beijing even includes primers on Quebec's history and its geography, including the names of suburbs around its biggest city, Montreal. Despite China's growing prosperity and clout, ever more of its citizens are rushing to the exits, eager to provide better education prospects for their children and escape from their country's long-standing problems, including hazardous pollution and contaminated food. Canada joins the United States and Australia among the most favored destinations. But many governments are making it harder to emigrate by imposing new quotas, cutting the professions sought under skilled-worker programs and raising the amount of financial commitment needed for the exemptions granted to big-time investors. That's where Quebec comes in. The province selects its own immigrants and doesn't have any cap or backlog of applicants like Canada's national program does. But it requires most immigrants to demonstrate their knowledge of French. Immigration agencies in Beijing started pushing this program over the past year. “This is the only way out, there's no other way,” said Quebec-based immigration consultant Joyce Li. These transplants must commit to living in Quebec in their application, but, later on, they can take advantage of Canadian rights to move to Toronto or Vancouver, which most investor-emigrants do, she said. Many Chinese have in the past sought to leverage their way into Canada with job skills, as family members of Chinese already there or with the country's emigrant-investor program. But a backlog of cases has prompted the federal government to halt some kinds of family sponsorship applications for two years, and cap investor applicants at 700 per year. So, Chinese are increasingly focusing on Quebec, said Zhao Yangyang, who works at immigration agency Beijing Royal Way Ahead Exit & Entry Service Co.
“That's why many people, whether they are rich or skilled professionals, are trying hard to learn French,” she said. Quebec's immigration minister, Kathleen Weil, said the province welcomes the heightened interest from potential immigrants. “We're happy about it and we want to keep them here,” she said. Even the sister of Vice President Xi Jinping, who is expected to become China's next president, lives in Canada, according to a Wikileaks-released US diplomatic cable that cites a former close friend of Xi's. Yin, who is studying French in polluted Tianjin and who teaches Chinese at a middle school, hopes to eventually study for a master's degree once she successfully settles in Canada.